Republican Sen. Thom Tillis is starting to express some concerns about offshore oil and natural gas drilling along North Carolina's coast as he gears up for what is likely to be a difficult re-election battle next year. North Carolina's junior senator was previously a vocal supporter of putting drilling rigs in the Atlantic Ocean, including near the Tar Heel State's coasts. But as he prepares to ask North Carolinians to send him back to Washington, D.C., for another six-year term, Tillis is showing signs he'll listen to the majority of the state's residents and oppose President Trump's proposal from last year to allow drilling all along the East Coast. "I think that we have to look through, get to the experts, cut through the rhetoric from people who are just clearly against any sort of energy exploration, kind of dispense with those positions and actually come up with a science-based, fact-based policy decision," Tillis told E&E News this week when asked directly about drilling off North Carolina's coast. Asked if he still supports drilling near North Carolina, Tillis said he supports "the process" of considering it. "I do believe we have to look at and see what resources are out there and whether or not they can be responsibly harvested," he said. Tillis in February wrote to acting Interior Secretary David Bernhardt, Commerce Secretary Wilbur Ross and other Trump administration officials to scrutinize the process of considering drilling and potential impacts on North Carolina. "While I understand that there are potential economic benefits coming from offshore energy production, I would like to hear more details about specific actions your agencies are taking to safeguard longstanding industries in our coastal communities," Tillis wrote. "I also request that you provide information about how your agencies will guarantee that the issuance of geological and geophysical surveying permits are limited and do not result in duplicative surveying activities." It marked a notable shift for the senator. Tillis got to the Senate in 2015 after beating incumbent Kay Hagan (D) by fewer than 50,000 votes in one of the country's most fiercely fought races in 2014. The freshman senator picked offshore drilling as the topic of his first speech on the Senate floor. Speaking in support of a measure that would have allowed for drilling off the coast, Tillis said any rigs would be at least 30 miles from the shore, "far beyond the site horizon of our beautiful beaches in North Carolina." At the time, the Obama administration was considering whether to allow drilling in parts of the Mid- and south Atlantic — including North Carolina — and Tillis was pushing a legislative amendment that would have required the Interior Department to plan for drilling rights lease auctions in both areas. A piece of the revenue the federal government brought in from drilling would have to go to the adjacent states. The measure, Tillis said, "is the fulfillment of a promise I made to the citizens of North Carolina. It also does enormous progress for creating jobs and helping our economy get back on track in the state and the region." Last year, when the Trump administration announced its plans, Tillis was on board (Greenwire, Jan. 4, 2018). But times have changed, and support for drilling off North Carolina could be a major detriment to Tillis, so seeking to moderate his position could yield significant dividends. A High Point University/News & Record poll last year found 53 percent of North Carolinians oppose offshore drilling, while 37 percent support it. Opposition to drilling is widespread and bipartisan in coastal states. Georgia Gov. Brian Kemp, Maryland Gov. Larry Hogan and the late Rep. Walter Jones of North Carolina — all Republicans — are among some of the officials who have fought against drilling near their states. Republican Katie Arrington lost last year's election to now-Rep. Joe Cunningham (D) to represent South Carolina's coastal, heavily Republican 1st District, largely because of her flip-flop on drilling off South Carolina. She defeated former Rep. Mark Sanford (R) in the primary, went all-in on Trump's coastal plan and then, when the backlash hit, changed her tune (E&E Daily, Oct. 12, 2018). Coastal residents, with fresh memories of the 2010 Deepwater Horizon disaster and 85-day oil spill in the Gulf of Mexico, often fear that a spill — or even the thought of one — would destroy their communities and coveted tourism. In 2017, the latest year for records, tourism brought in nearly $24 billion, according to state data. "I think this does pose a real risk for Tillis. North Carolinians strongly believe in the sanctity of their coastlines," said David McLennan, a political science professor who follows federal elections at Meredith College in Raleigh, N.C.
"Tillis is reading the tea leaves very well," he said. Should he make a complete about-face, he would not be the first politician from a coastal state to do so. Both of Virginia's Democratic senators, Tim Kaine and Mark Warner, as recently as 2015 supported offshore drilling efforts led by the Obama administration, the very efforts Tillis spoke out for in his first floor speech (E&E News PM, April 23, 2015). Both men now oppose the Trump administration's plans. But that doesn't mean North Carolina Democrats won't come after him. The North Carolina Democratic Party said his past support for drilling will likely play into next year's campaign. "Thom Tillis' support for offshore drilling will be a Deepwater Horizon-sized liability for him in 2020," said Robert Howard, a spokesman for the party. "Opening up our coast to drilling would put our economy, our environment and our coastal communities at serious risk. Tillis is on the wrong side of communities up and down the coast, and rather than own it, he's trying to hem, haw and dodge." Tillis' actions, however, could help to distance him from Trump in a heavily purple state, McLennan said. 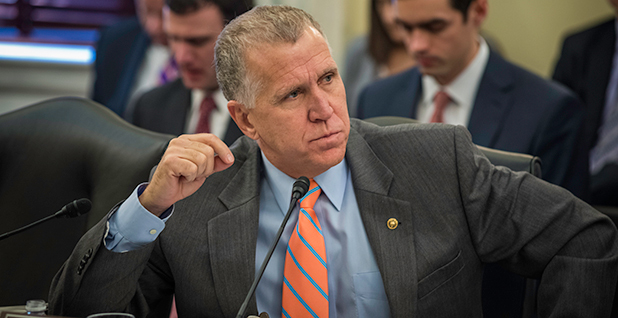 Tillis has shown a willingness to depart from Trump in a number of areas recently, including opposing the president's declaration of a national emergency to build a wall along the border with Mexico. The North Carolina Senate race is expected to be highly competitive, with Democrats planning an all-out assault against Tillis. So far, there are three announced candidates, according to The Charlotte Observer, but national Democrats are still seeking a top-tier candidate who can bring a lot of money to the table in what is expected to be an expensive race. North Carolina is "no longer a cheap date," Jennifer Duffy, an expert at the nonpartisan Cook Political Report, told the Observer in January. Bob Woodard, chairman of the board of commissioners of coastal Dare County, said supporting offshore drilling is dangerous for politicians. "I would say that's not a very politically palpable stance to support offshore drilling off our coast," he said. "That would certainly not be in your best interest." Woodard, a Republican, has been an outspoken opponent of offshore drilling, fearing it would decimate Dare County's $1.2 billion tourism sector. He and other local leaders and environmentalists sent a series of letters to the editors of local newspapers recently responding to Tillis' new concerns about drilling. But Woodard didn't criticize Tillis. He said Tillis' staff was in touch with him recently about the senator's concerns, and the two are planning to meet soon to discuss them. "I'm giving him the benefit of the doubt, because he's going the extra mile," Woodard said. "That's very encouraging to me." Tillis' staff did not respond to questions about what response, if any, he's gotten from the Interior or Commerce departments. Interior is planning in the "coming weeks" to carry out the next stage of considering whether to allow drilling along the Atlantic, Pacific and Arctic coasts through 2024 by releasing a "proposed plan," Walter Cruickshank, acting Bureau of Ocean Energy Management director, told House lawmakers at a Wednesday hearing. That plan will be a revision of the January 2018 proposal. Interior would then take public comments on the latest version for 90 days before writing a final version setting lease sale schedules for the next five years.